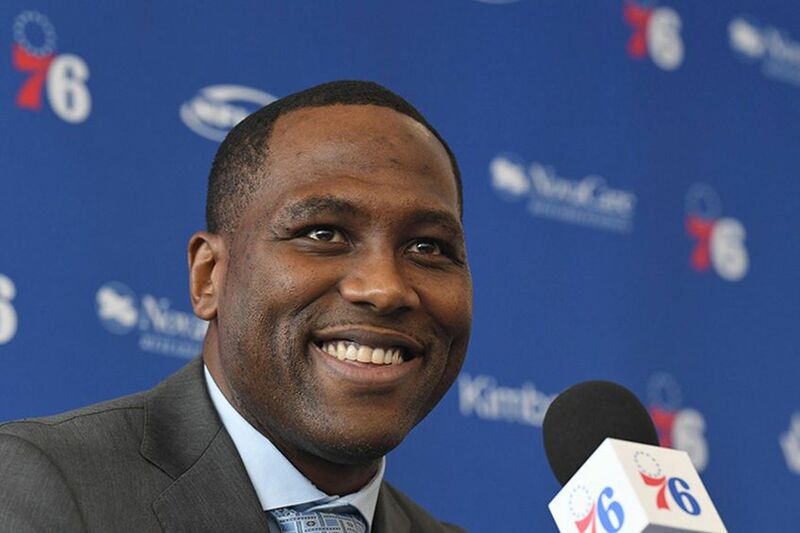 Elton Brand smiles after being introduced by Sixers co-managing partner Josh Harris as the new team general manager on Thursday. Among the more conspicuous figures to witness Elton Brand's introductory press conference as Sixers general manager was a bald man in a crisp blue sports coat who floated through the crowd like a ghost of NBA past. David Falk is not the super agent that he used to be, nor does he express a desire to return to those days. But of all the people who packed the second-floor lobby to witness Brand's first public appearance in his new role, only Falk could claim to have played a leading role in creating the economic landscape that the Sixers' new GM must now navigate. Not that he would make that claim. The business has changed, and, Falk would contend, not for the better. There are different rules, a different code, a different sense of propriety. Yet on several different occasions during Brand's press conference, we heard it said that the NBA had become a "player-driven league," and no one deserves more credit for driving it there than Falk. Nineteen years ago, when Falk first met Brand for an hour-long pitch on the Duke University campus, the agent was at the height of his power, with a portfolio of clients that included more all-stars, more rookies of the year, and more lottery picks than any other agency in the sport. "I didn't do a very good job," Falk said of the meeting. "I didn't think he'd pick me." As it turns out, Brand would become one of Falk's last blockbuster clients, a No. 1 overall pick who went on to earn nearly $170 million in a 17-year playing career. That total included a five-year, $80 million deal with the Sixers that, ironically, helped set the stage for the Process that Brand is now charged with completing. "I believe most players wait too long before they start thinking about the next phase of their life," the 68-year-old Falk said. "Most people end their careers in their early 30s, and Elton being as bright and engaging as he is, I've always challenged him. We're in partnerships in certain businesses off the court, different venture capital, and I've always challenged him, what's the next step. When he was very young, before our business became as corrupt as it is, I thought I would hire him. I think this is a natural fit." Falk has had clients make the transition before. Danny Ferry, another Dukie, followed a path similar to Brand's, becoming the general manager of the Cleveland Cavaliers two years after retiring as a player. The Cavs went 272-138 with an NBA Finals appearance during Ferry's tenure. Although he failed to build a championship team around LeBron James, Ferry wasn't a failure. John Paxson oversaw the Bulls' return to relevance while general manager from 2003-2009. "When people talk about experience in the job, Steve Kerr never coached a game in his life and won an NBA title," Falk said. "Mark Jackson came out of the broadcast booth. Doc Rivers. Some of the best talent in the league didn't have experience." Brand, Falk says, is not someone who will attempt to skate by on name alone. "Number one, I think he is a very, very hard worker," Falk said. "This is not a cosmetic job or a title. How many guys would go into the G-League and run a G-League team? He's not doing this for the money. He's made a lot of money, and he's done a really good job investing it. This is something he really feels is a natural for him." The Sixers hope that Brand's ability to relate to players and market the city and its up-and-coming roster will help the organization attract the kind of superstar talent that it tried and failed to land this past summer. Falk, for one, sees merit in that approach. "I think he's in a window where he is young enough where people know him as a player and he's old enough to understand the business side," he said. "I think that (the Sixers) have a great core, two very special young players in [Joel] Embiid and [Ben] Simmons. It's one of the top 10 media markets in the country. There's a great history to the franchise. And I think that today's generation of players has demonstrated a desire to team up, Kevin [Durant] going to Golden State, LeBron going to Miami. They have two-thirds of the equation here. They need a third or possibly a fourth. I think it's going to be very attractive to a lot of players. "It's all about fit. I believe that free agency is about fit. I think that if you were DeAndre Jordan you probably wouldn't want to come here, because you've got Embiid. If you were a point guard and you see that Simmons could be the next Magic Johnson kind of player — but I think almost any other position on the floor, if you could be that guy, not necessarily the third option but the third part of a triangle, I think that's very attractive. A major media market, that's great for marketing. I think it's going to be very attractive. And I think he has the ability to sell that." It's just one man's opinion. But it is certainly informed.